By David Ponce on 11/02/05 • Leave a comment! 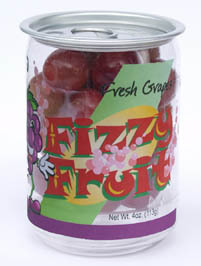 The Fizzy Fruit Company is now making carbonated fruit. In other words, regular everyday fruit (like the ones that grow, you know, naturally, with sun and stuff), with added bubbles. Seems they keep their nutritional content, what with carbon dioxide being inert in food and all. They’re being made on the assumption that children are more likely to eat fruit if they’re fizzy. Hell, if you’d have shown me a fizzy strawberry as a kid, I’d have snapped it up in a second. So maybe it’s a good idea after all. The company says they’re going to initially be distributed at selected schools in Fall 2005, and other stores nationwide “soon”. Check out the funky website.